So, the secret of the strawberry design lies in the heart-shaped tins. They look quite spectacular but are really easy to make! You can basically bake any cake recipe you like and use any filling (or no filling), whatever suits you best! I decided to make a simple sponge cake filled with a vanilla butter cream and added a few fresh strawberries to the buttercream. Make enough cake mixture for two little heart-shaped cake tins (or one big one) and bake the cake(s) until a skewer comes out clean. Let them cool on a rack before you cut them in half and sandwich it together with buttercream and strawberries. For the buttercream you need twice as much icing sugar as you need butter. For a smooth cream the butter should be at room temperature. If you want you can use some flavors like vanilla or orange for the cream to taste even more delicious. I decided to go for the vanilla flavor 🙂 When the buttercream becomes too firm, simply mix in 1 or 2 tablespoons of milk to make it more creamy. 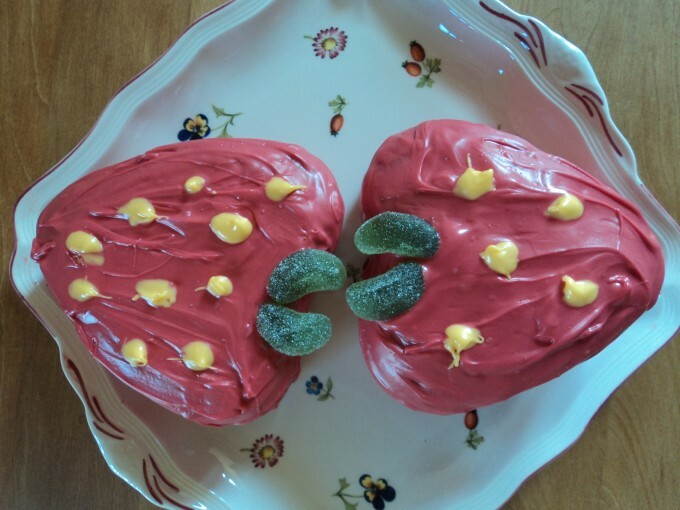 Spread onto the heart-shaped cakes and sandwich them together! I have used red and yellow Candy Melts, melted au bain marie, but you could also use a microwave. Once melted and smooth, cover the cake with the red Candy Melt and let it set. 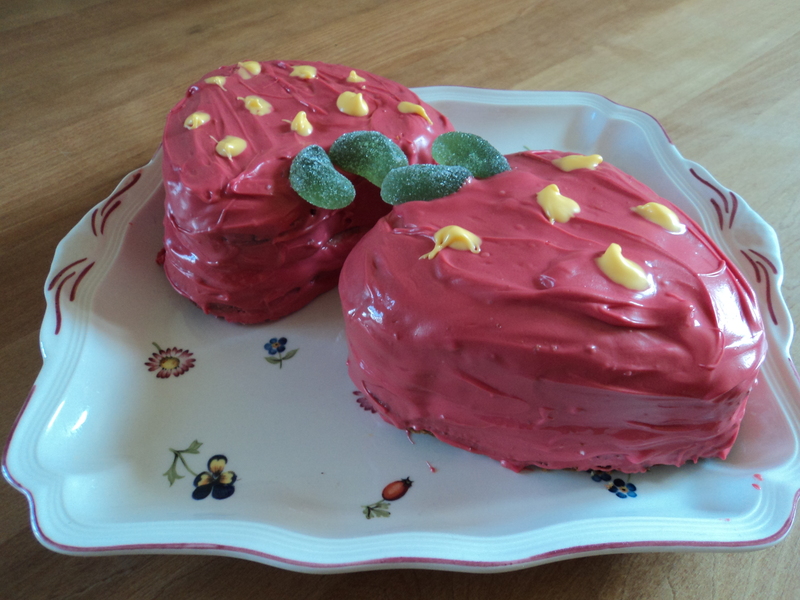 I found it easiest to just use a teaspoon and dip it into the yellow Candy Melt to make small strawberry seeds 🙂 But if you are longing for perfection, just use a piping bag to get even strawberry seats. For the leaves I used green sugared candys, glued on the cake with a little more Candy Melt 😀 Let everything set until dry and enjoy the cake (and Mother’s Day)!